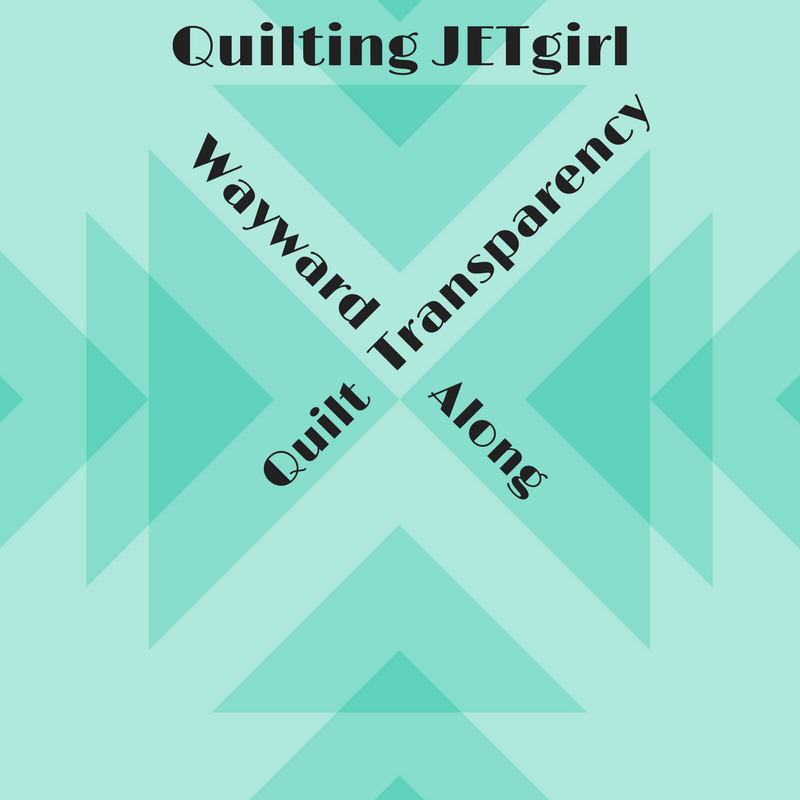 Yvonne Fuchs from Quilting Jetgirl hosted a quilt along called Wayward transparency. Thank you, Yvonne, for this awesome pattern. I picked up some silk fabric on my recent India trip and decided to use them for this quilt. The colors are not exactly light-medium-dark of the same color but they seem to work well together and give a transparency effect. This is not my first time working with silk, so I knew this is not going to be easy. I used a lightweight interfacing (Heat’n Bond Non-Woven Lightweight Fusible Interfacing) to back the silk. With the interfacing, it has almost the same weight as quilting cotton. It was easy to cut and sew for the most part. However, with right sides together, the silk is more slippery and does not “stick” together as cotton does. I had to pin a lot during piecing as well as for matching seams. Also, I had to remember to turn down the heat on the iron – use the silk setting or slightly warmer. I scorched a couple of HSTs initially but fortunately, I had enough fabric to make up for them. I love how this turned out. The silk has directional color – the warp and weft threads are slightly different shades. This is quite common in Indian silks, especially saris. This is particularly apparent in the dark background fabric. Sometimes it looks like dark coffee brown (indoors) and sometimes dark cherry-purple (outdoors). I did not take this into account in the piecing. I’m amazed how different it looks from different angles. I’m not quilting this yet. Waiting on getting better with my skills on my new mid-arm quilting machine. Linking up One monthly goal finished, Wayward transparency, Let’s Bee Social and Finish it up Friday at Crazy mom quilts. Do you remember the match the following quizzes we did at school? Believe it or not, I loved them. I came across one again in a training I was doing for work this week. This quilt was inspired by the match the following quiz, only more colorful. I started with a fat quarter of background fabric and some colorful 1″ wide scraps. I cut the background into three columns – the questions, the answers and the match lines. See my diagram. I cut along the lines one by one and sewed them back with the 1″ sashing. I marked my diagram on the wrong side of the fabric – so the quilt was a mirror image of what I wanted. I used a really cool chemical compound fabric for the backing. When I saw it first I thought they were caffeine molecules but on further research, they appear to be the four nucleotides that make up the DNA – Adenine, Thymine, Guanine, Cytosine. That’s so cool! I’m not sure which way I’m going to hang this quilt, so I made sleeves for all 4 corners. I used two layers of Warm & Natural cotton batting and quilted straight lines about 1″ apart. This was a small, fast and original project I loved making. I’m planning on doing one more – this time drawing the schematic on the right side of the fabric and paying more attention to matching the seams, and taking more pictures on the way so I can write up a tutorial. This was also one of those spontaneous projects that takes hold of you and doesn’t let you rest till it’s done. Got the idea on Monday and picked out fabrics that evening, cut them up on Tuesday, pieced on Wednesday, quilted on Thursday and added binding and this post on Friday. All this in the evenings after work. Yvonne Fuchs from Quilting Jetgirl hosted a quilt along called Wayward transparency. It’s a simple and lovely pattern, and with the right color values, yields a nice transparency effect. I picked up some silk fabric on my recent India trip and I’m going to use them for a wall hanging. This is my One Monthly goal for Jan 2018. One Monthly Goal is hosted by elmstreetquilts.